Renee Robbins is a Chicago-based visual artist who layers biomorphic forms to create detailed otherworldly environments. She has been awarded public art commissions with Chicago Public Art Group, Wabash Arts Corridor, and Illinois’ Art-In-Architecture program. She has exhibited widely, including exhibitions at Lois Lambert Gallery, Santa Monica, CA; Fermi National Accelerator Laboratory, Batavia, IL; Firecat Projects, Chicago, IL; and the Alden B Dow Museum of Science and Art, Midland, MI. The Chicago Gallery News featured her work as a ‘Young Chicago Artist’ to watch. 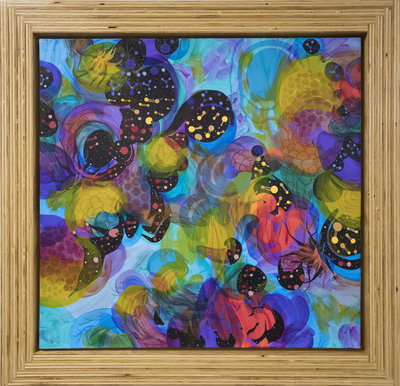 The forms in her paintings have been classified by a diatom taxonomist in an artist feature on the US Diatoms database at the University of Colorado. Her public art projects have been featured on PBS WTTW’s Chicago Tonight, Fox 32, and in Chicago Magazine. Robbins received her MFA from Michigan State University and a BFA from University of Kentucky. She has been working Renee Robbins in front of Tilt-a-Whirl in Chicago for more than a decade.